Lose weight hypnosis is the fastest way to lose weight. How many diets have you tried? How many were successful for the long term? Wouldn’t you like to be able to lose weight fast and keep it off? Keep reading to learn how to lose weight fast. What makes you fall off of a diet? Sweets? Thick crust pizza? With hypnosis it doesn’t matter what leads you to quit your diet. Lose weight hypnosis is going to make your desire for that food go away. What is required to lose weight? To lose weight, your body has to burn more calories than you consume. You usually feel like you have to exercise like a maniac. If you don’t, you have to eat like a rabbit. Sometimes neither have much effect. And the whole time you are being tortured by cravings that are nearly impossible to ignore. Your appetite takes over. What is the difference between Appetite and Hunger? Why is appetite so hard to control? Appetite isn’t the same as hunger. Hunger is your body calling out for nourishment. Appetite is eating and drinking for pleasure. Your appetite causes the cravings that give you the compulsion to eat or overeat. Your appetite is in your mind. Your mind can scream very loudly when you are having a craving. It’s simply too hard to stay on track when your mind is screaming at you to pick up a Snickers bar or a bag of Lays. Or, like Dolly said, potatoes and gravy. Stress: The pressures of daily life causes one to feel stressed. Even being overweight can cause stress. You worry about how you look, how other people see you, your relationships and your future. Your own thoughts can sabotage your efforts to lose weight. Conditioned response eating: Do you crave food when you do a specific thing or go to a specific place? It is because food has become associated with those activities and environments. For example, if you eat while you watch TV: Your unconscious will ‘take a picture’ of what you see. In this case you see the food in your hand coming towards your face. And you see the TV screen in the background. So those two images become associated with one another. After you’ve repeated this scenario a few times, the next time you watch TV, your subconscious notices what is missing. So it will “Flash” an image of the food in your hand, coming towards your mouth. That unconscious image will trigger a craving. This is one reason why cravings are extremely difficult to overcome using conscious thought. Remember, in this example, it is the unconscious image of food in your hand, coming towards your mouth, paired with the image of the TV that triggers your cravings. What is Lose Weight Hypnosis Magic? There is a solution. You can use lose weight hypnosis to communicate with your subconscious mind to change the unconscious images. That will stop the cravings! Lose Weight Hypnosis is completely natural. Lose weight hypnosis is completely natural. It is the Alpha state of consciousness, which we reach naturally every day. You are in the Alpha state just before you fall asleep, as you awaken, and when you day dream or watch TV. With lose weight hypnosis, it is possible to lose up to 16 times more weight! Research has proven that when hypnotherapy is used, along with a weight loss program, it makes a huge difference in the results. You are in the Alpha state for two-thirds of the time you are watching TV. The TV acts as your hypnotist! So when you watch TV, you are being hypnotized to crave what you see in the commercials. A hot, out of the oven pizza, fills up the screen, dripping cheese and tangy toppings, the crust oh so perfect. You can almost smell the aroma and you suddenly want pizza right now. You want it even if you aren’t hungry. 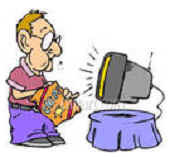 You can reverse the TV effect and stomp out cravings with self-hypnosis. Lose weight hypnosis is very effective and can be achieved using hypnosis CD’s. Self-hypnosis is safe. And it can be just as effective as expensive private sessions with a hypnotist. How safe is self-hypnosis? Hypnosis is one level above natural sleep. The worst thing that can happen during a self-hypnosis session is that you fall into a natural sleep. If that happens, you will simply awaken after about 20 minutes, feeling refreshed and no longer in a state of hypnosis. Just be sure when you are purchasing hypnosis CD’s that they are from an experienced and capable hypnotist. The first thing that has to happen to lose weight is that cravings must be eliminated. The first thing that has to happen to lose weight is that cravings must be eliminated. Neuro-VISION® is a lose weight hypnosis program that is highly successful at deleting your cravings. It’s the fastest way to lose weight. It’s also comfortable! No willpower is required! 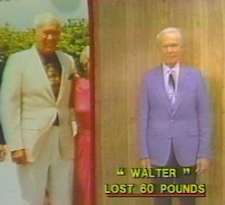 Walter Gratkowski knew how to lose weight, but could never keep it off. For twenty years, he would lose weight and gain it back like a yo-yo. He really lost hope that he would ever keep the weight off. Walter tried the Neuro-VISION video hypnosis program. He realized the problem was all in his mind. He lost sixty pounds in only three months! Video: See and hear Walter’s story. Forget radical diets or fat blocker pills. With weight loss hypnosis, your mental habits will be retrained. That’s where we fail, right? Who has ever had an unstoppable craving for carrot sticks? It’s always something fatty or sugary that follows us around. Once your mind is retrained, healthier eating habits and a normal appetite will form. Lose weight hypnosis will also help you with any unconscious issues that are sabotaging your efforts. As I said before, your brain is programmed to crave a snack when you sit down in front of the TV. Weight loss hypnosis will reprogram it. Remember, in the earlier example, it was the unconscious image of food paired with the image of the TV that triggered your cravings. Neuro-VISION® video hypnosis is based on the science of Neuro-Linguistic Programming (NLP). Neuro-VISION utilizes a technique called the NLP ‘Flash’. The Flash trains your unconscious mind to eliminate cravings by automatically changing mental images at the unconscious level of mind. Right now, when you sit down in front of the TV, your unconscious mind flashes an image of food in your hand, coming towards your mouth. After watching the Neuro-VISION video, your unconscious will replace the image of the food in your hand, with an image of a thin and attractive “you”, watching TV without any food in the picture. That is all it takes to eliminate conditioned response type eating. The Neuro-VISION video hypnosis technology reprograms your subconscious mind to disassociate food from every environment that it has been unconsciously associated with. The Neuro-VISION technology uses similar techniques to eliminate anxiety and stress. Your mind is trained to automatically exchange stressful thoughts with soothing thoughts. You feel so relaxed, that you lose the need to eat or drink for relaxation and pleasure. How effective is Neuro-VISION® weight loss hypnosis? For many people, the Neuro-VISION video hypnosis technology has been effective after just one viewing. Of course, for long lasting results, you will want to utilize the program for a minimum of twenty-one days. Neuro-VISION was found to be so unique and effective, that it is the only video hypnosis / NLP technology to have ever been granted a Registered US Patent! Alan B. Densky, CH is the developer of the Neuro-VISION® Video Hypnosis Technology, which received a US Patent because of its effectiveness. 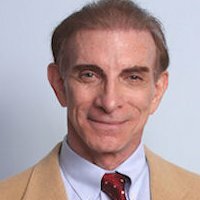 Mr. Densky’s latest undertaking has been to make the Neuro-VISION Appetite & Smoking Control Videos, and a long list of his other recorded hypnosis titles, available to the general public thru his company’s Neuro-VISION.us web site.